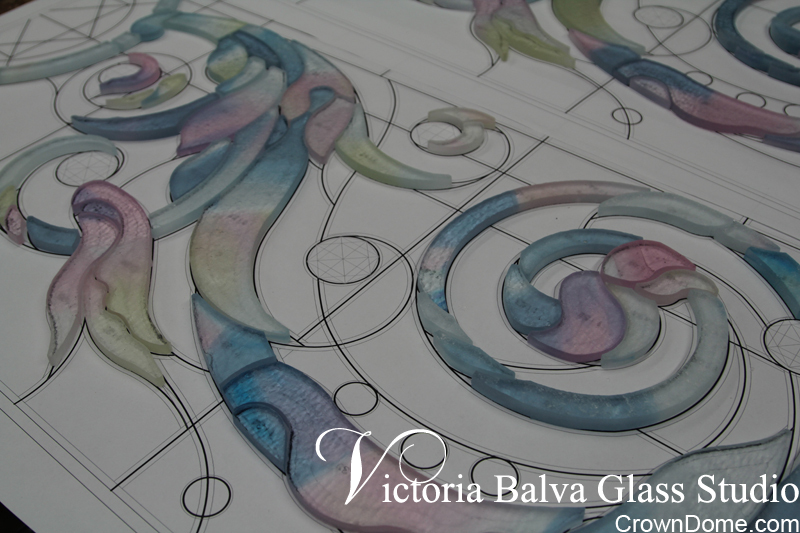 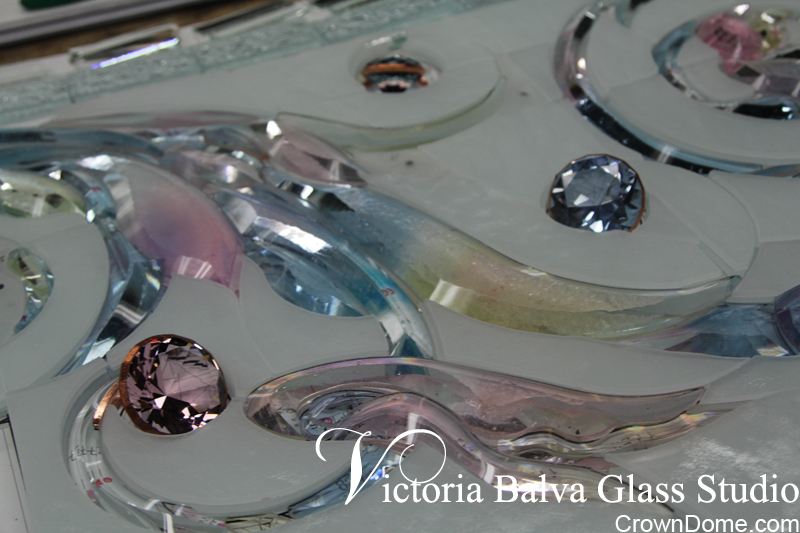 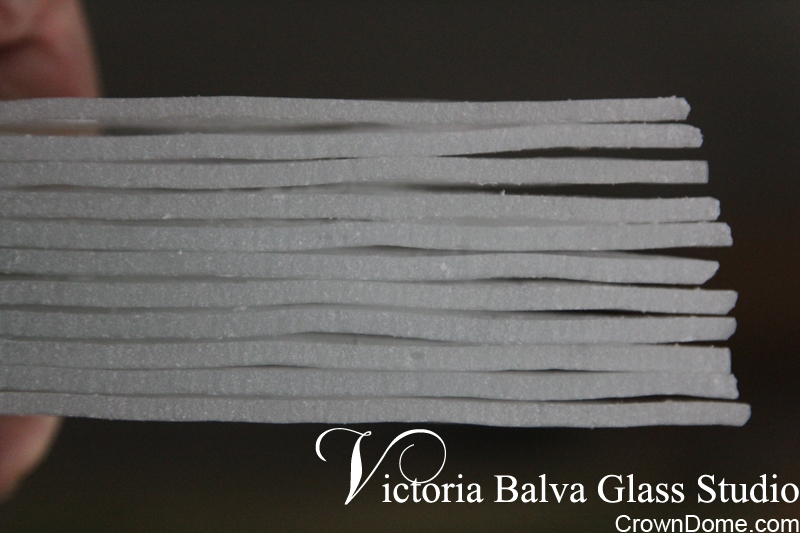 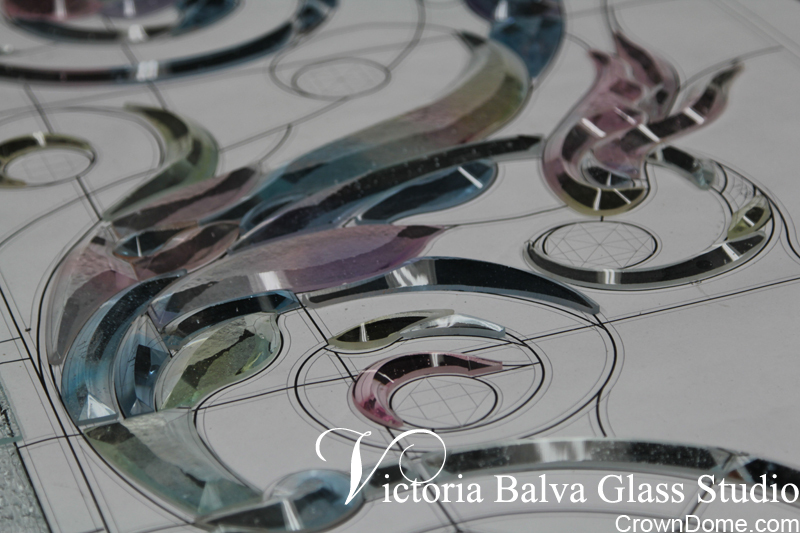 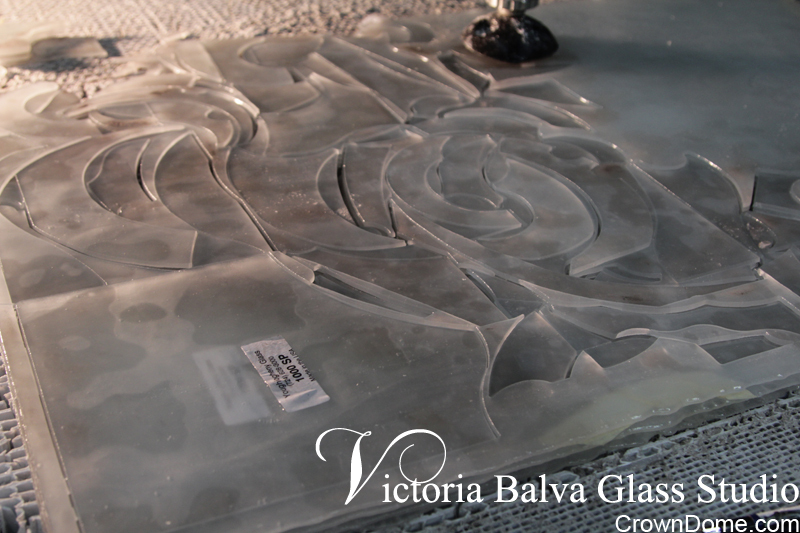 The lost art of hand bevelled glass taken to the new level. 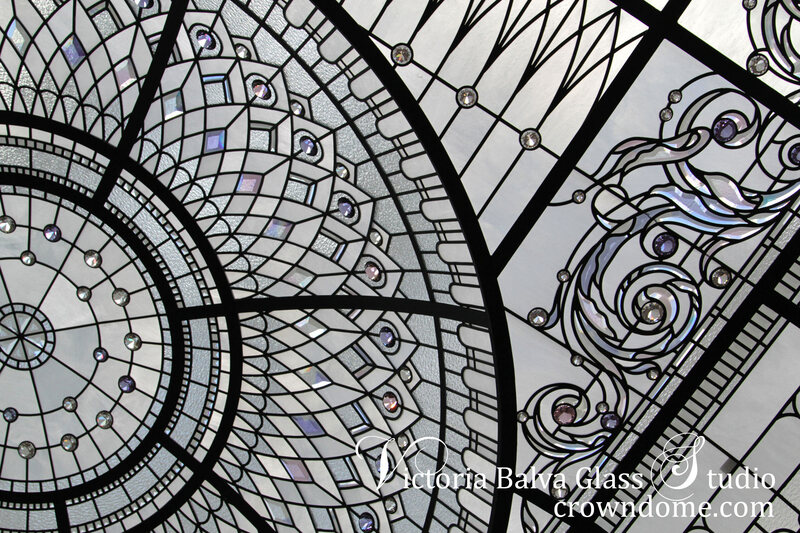 Bright and shiny ... colored beveled glass acanthus border and crystal pale jewels are great accent highlights for a large domed skylight. 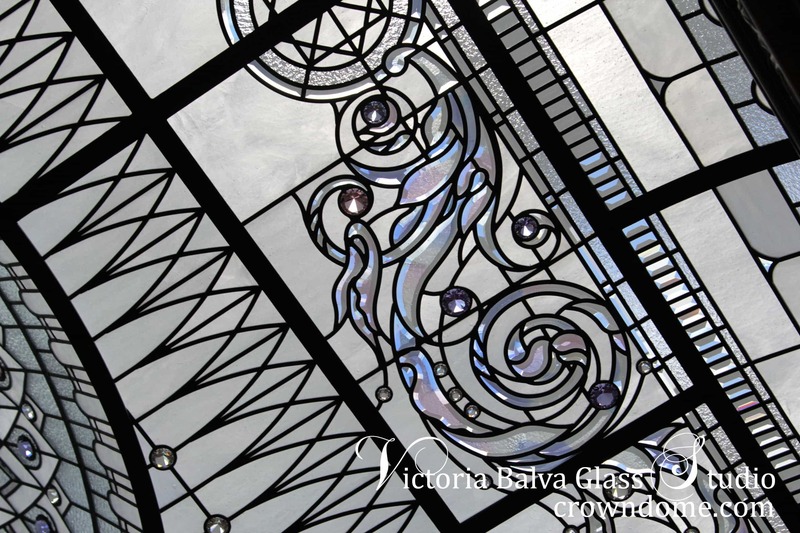 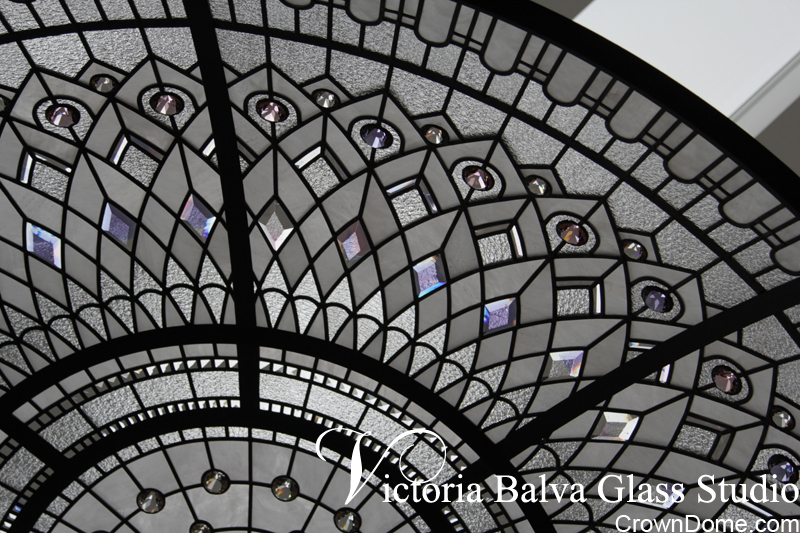 One of the most amazing elements used in this leaded glass skylight is custom made hand beveled colored glass. 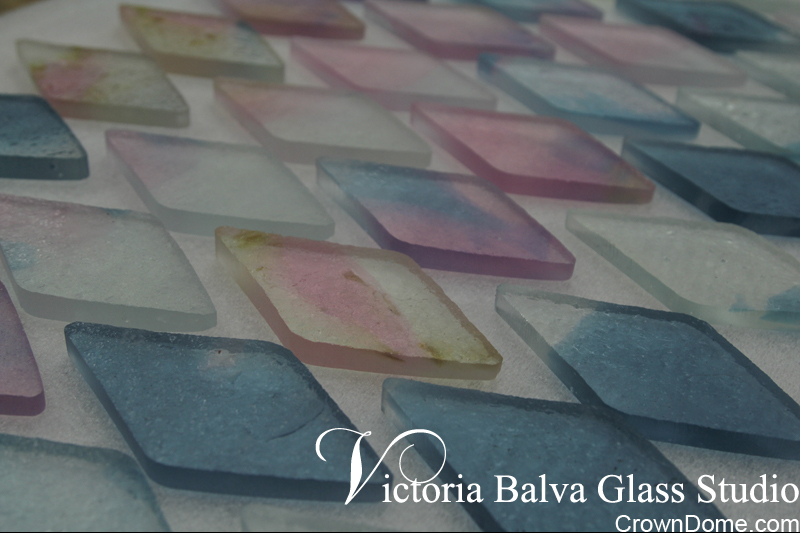 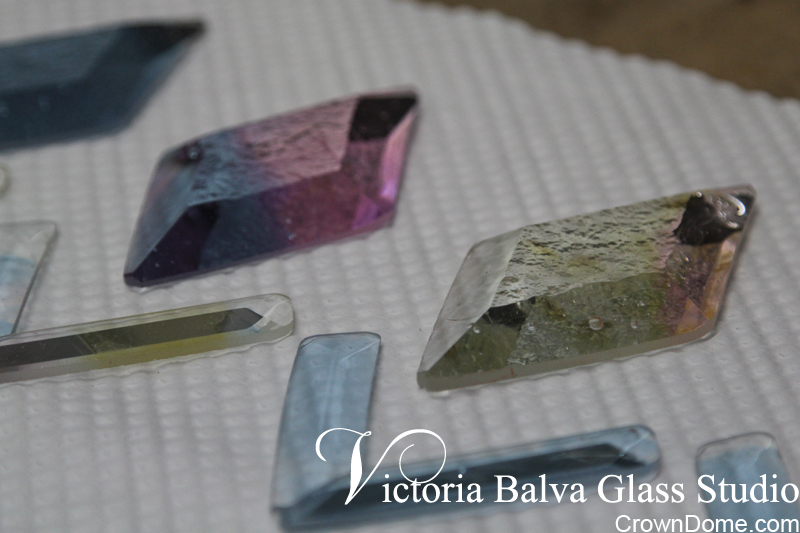 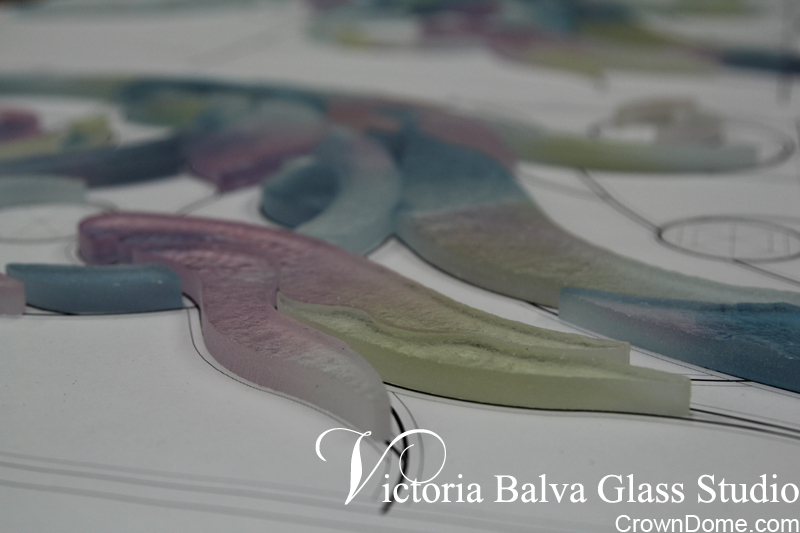 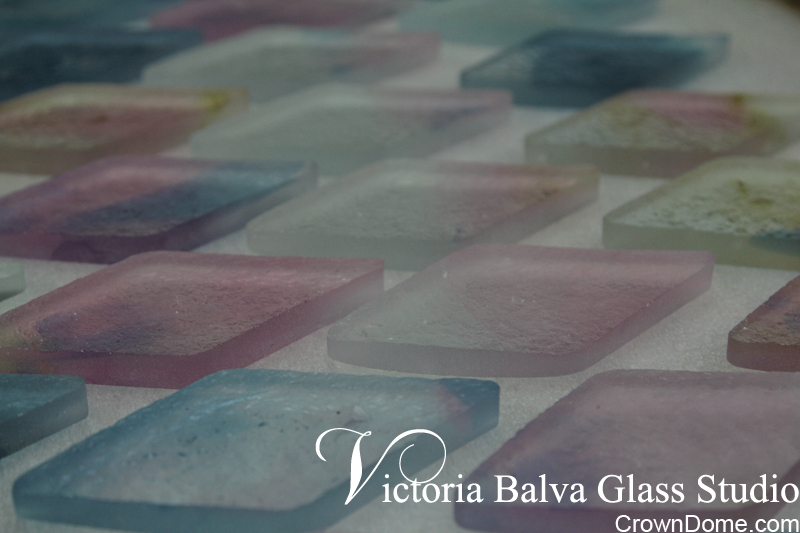 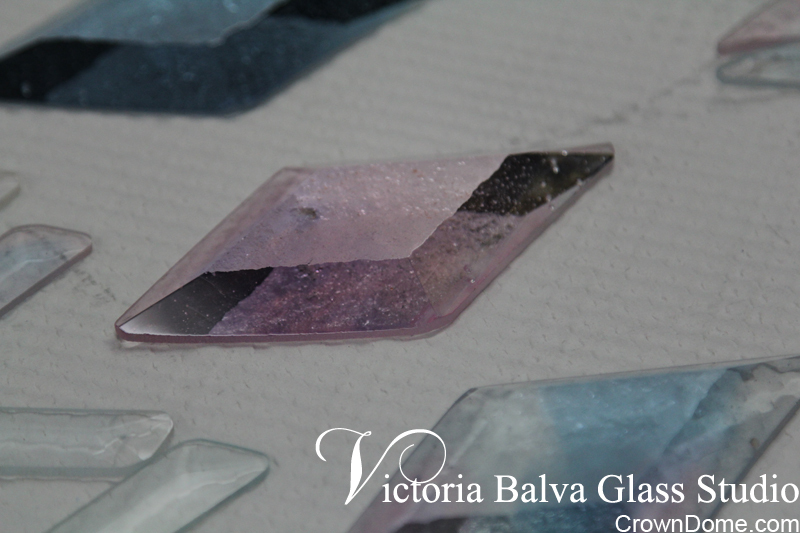 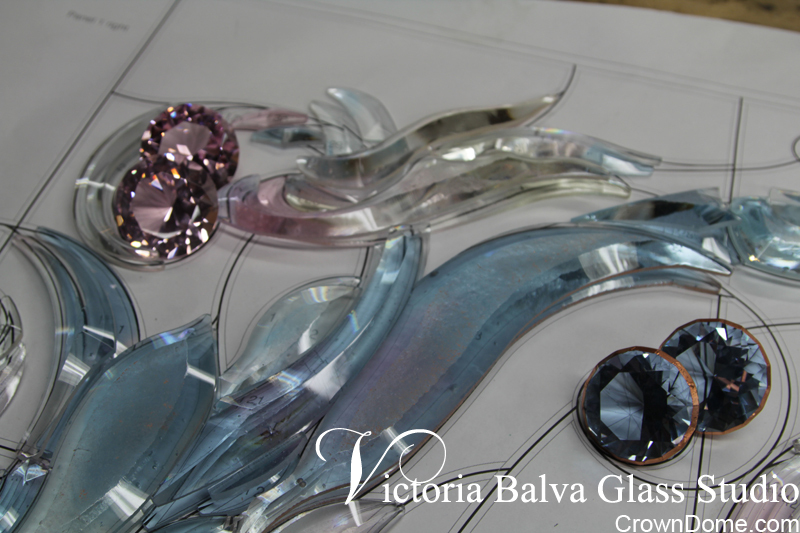 Each piece of beveled glass has a color stretching of delicate elusive colors of neon (lilac), pink, straw and pale blue to expose a sole of glass: transparency, brightness, color, texture. 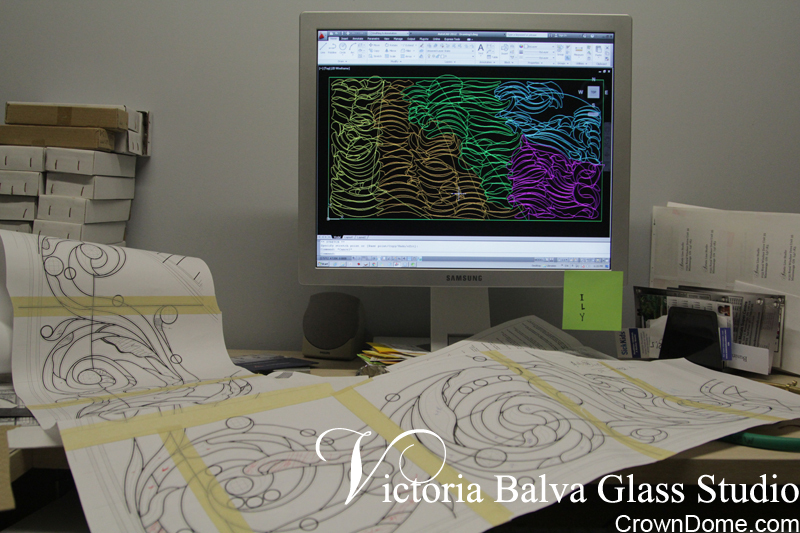 The team behind worked really hard. 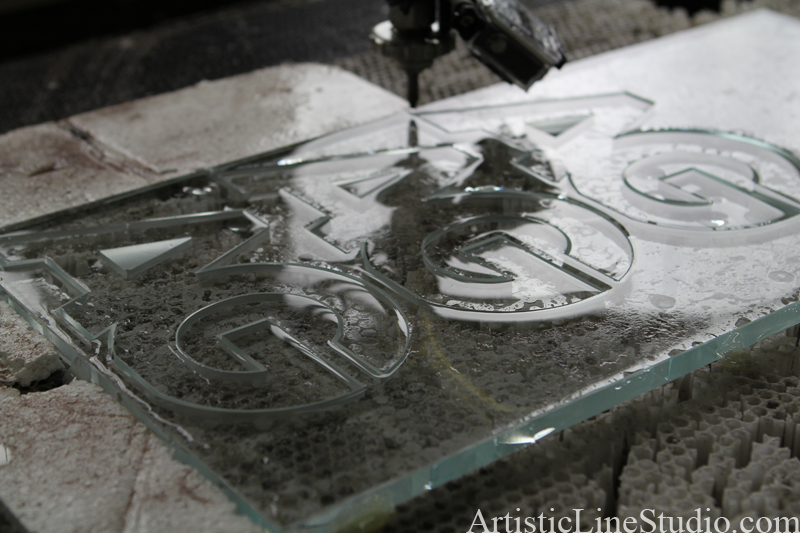 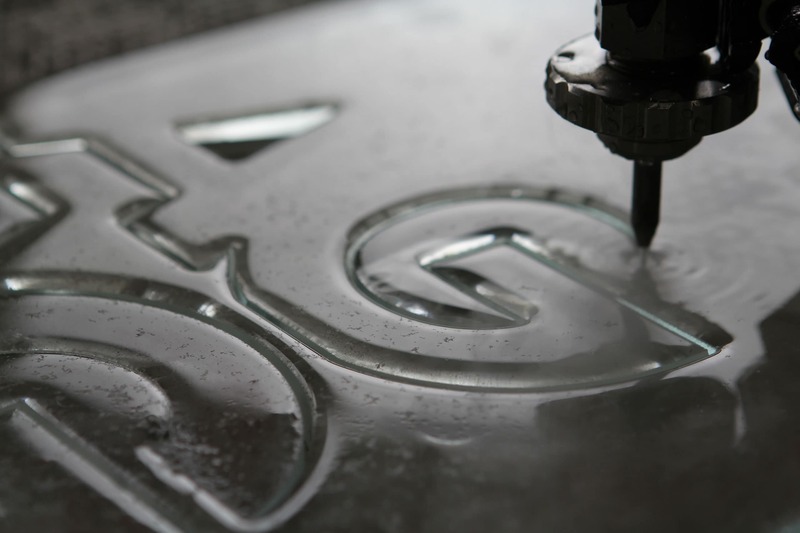 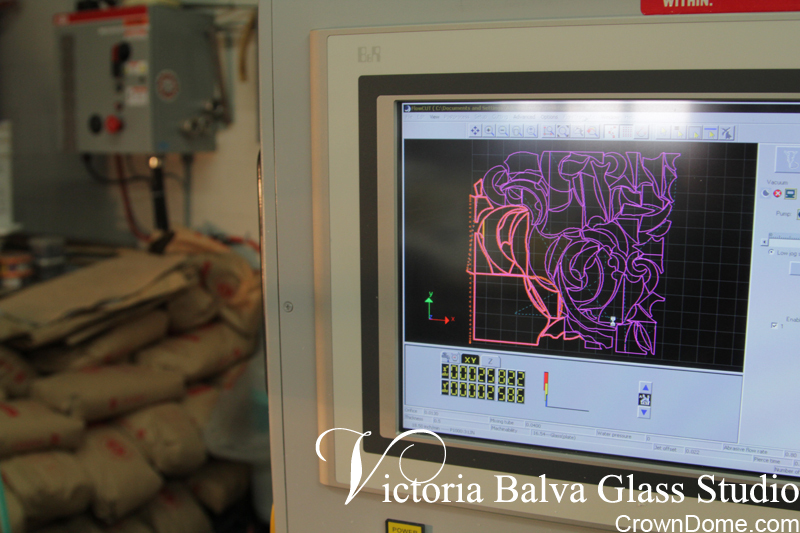 First, glass was formed in our large computer controlled kiln in a few stages, all elements were programmed for CNC machine and water jet cut in our studio in Mississauga. 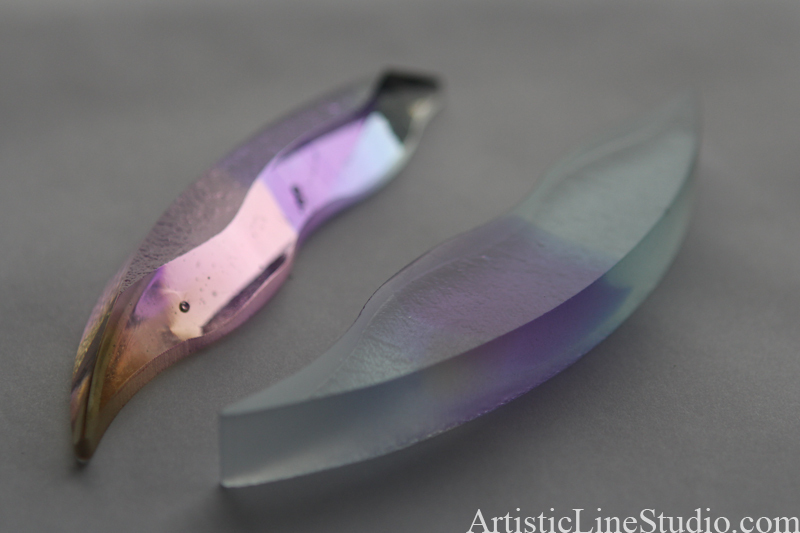 Black opal glass looks gorgeous! 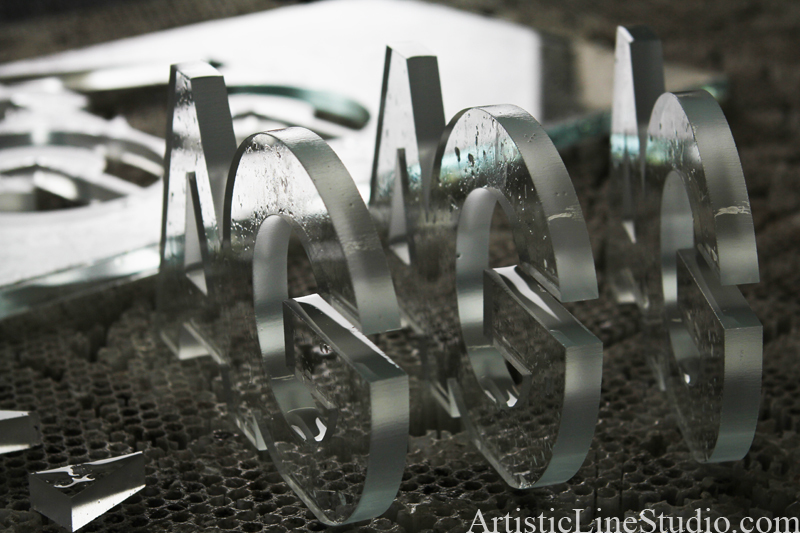 We cut 170 ovals for the client in Flesherton using our water jet machine! 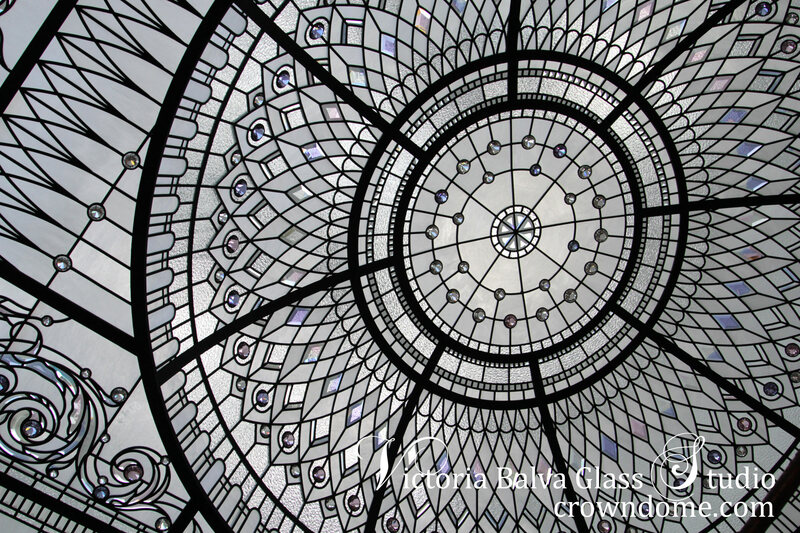 We are getting ready for new leaded glass skylights and domes! 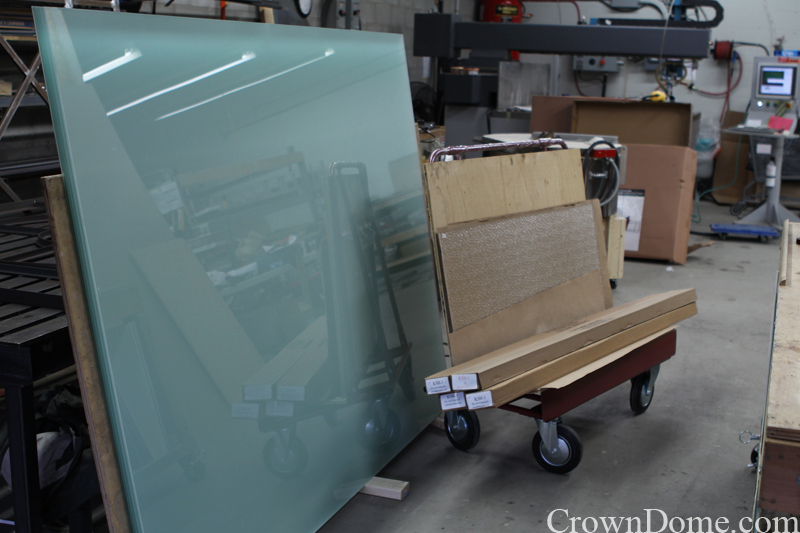 Acid etched glass just arrived from Europe, Spectrum clear textured and bevelled glass from the USA, and lead came from Vancuver! 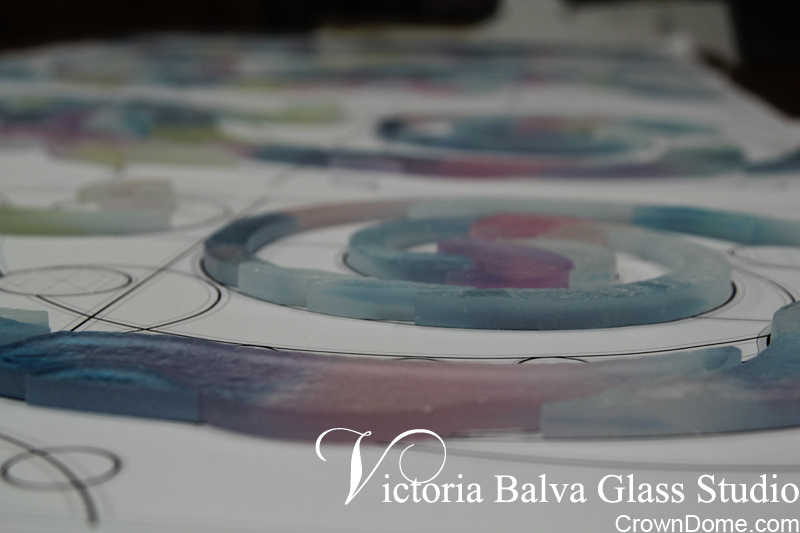 We are excited and looking forward! 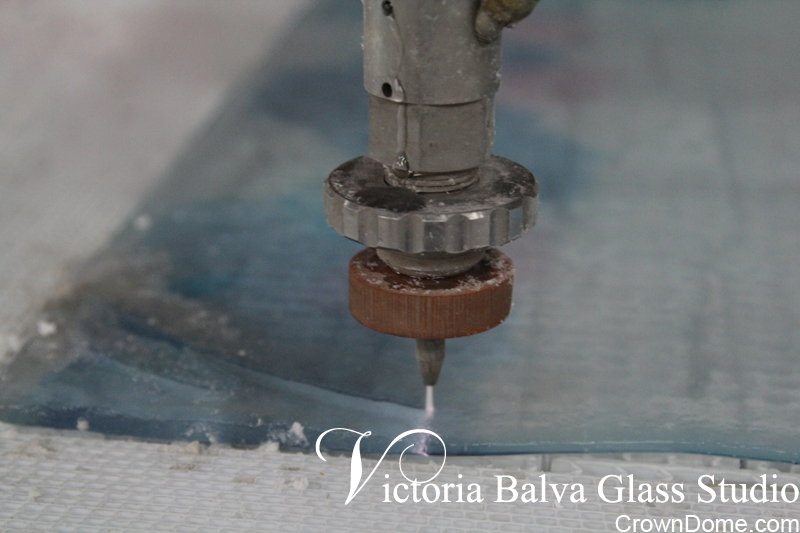 Recently we had a chance to use our water jet machine to help Lucy and Libor from Cascade Hand Cut Crystal to cut a starphire 12 mm glass. 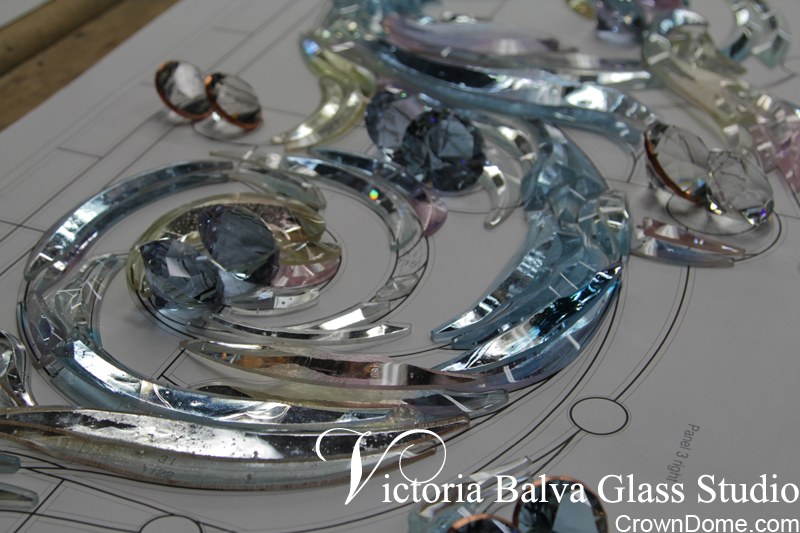 It is still a lot of polishing and cold work is to be done. 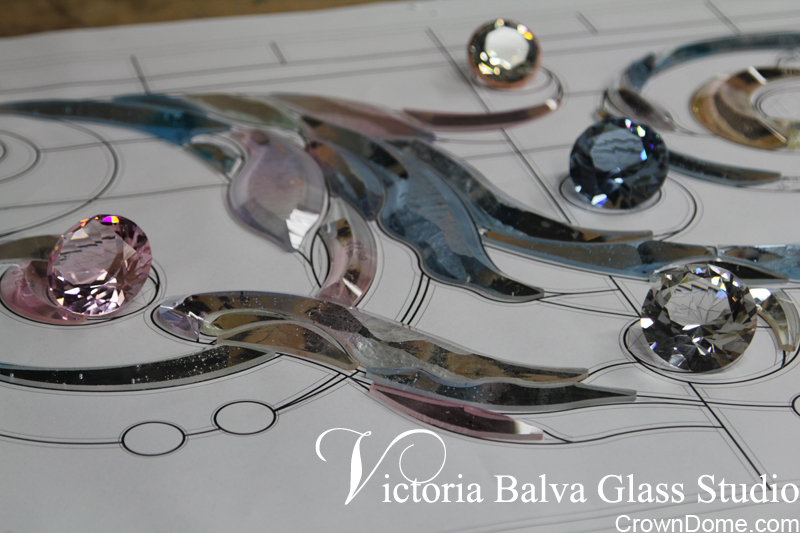 Here is a process in our studio! 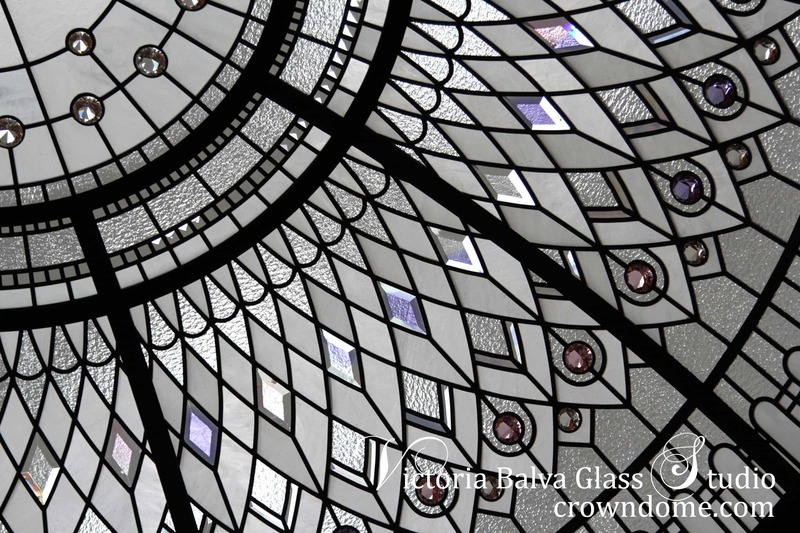 I just want to thank Libor for a beautiful custom beveled glass peace that he fabricated for our leaded glass dome presentation in Minneapolis. 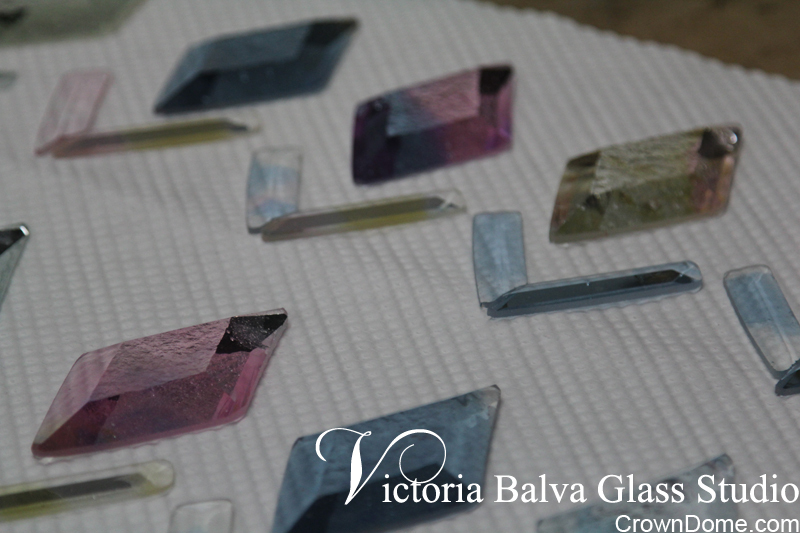 We fused pale lilac, blue and yellow glasses. 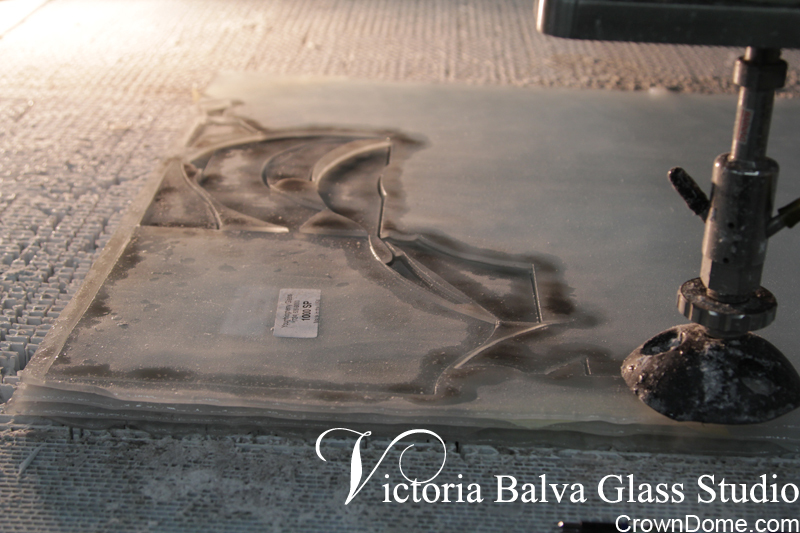 Then the kiln formed slab was cut with our water jet machine. 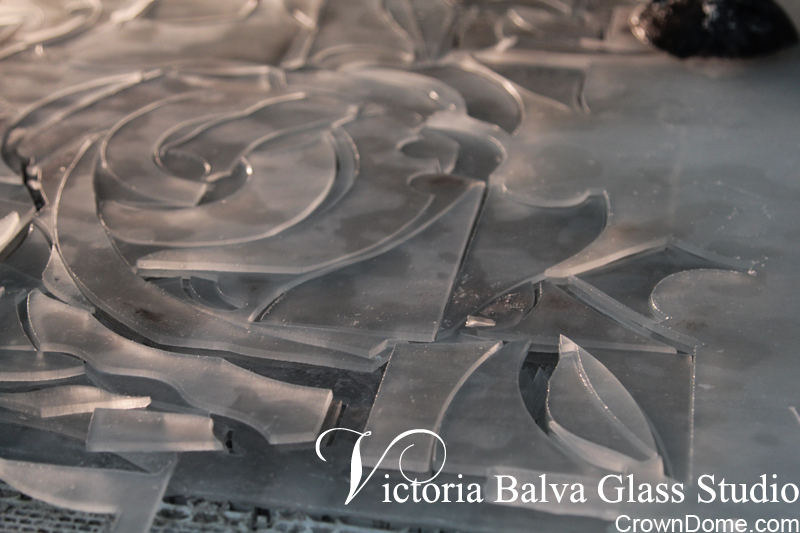 Libor turned it into beautiful custom made beveled glass peace! 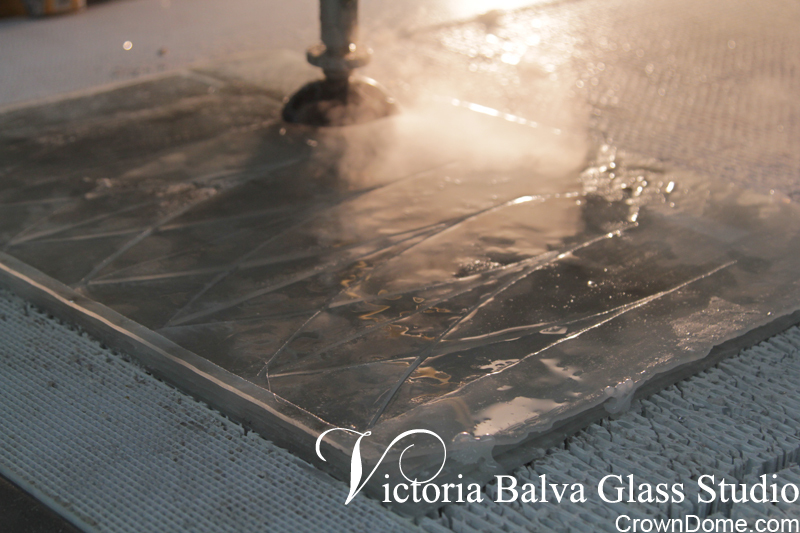 Please notice what a great difference cold worked glass makes!